Hi everyone! It's Julie Ann from Magpieheaven here. 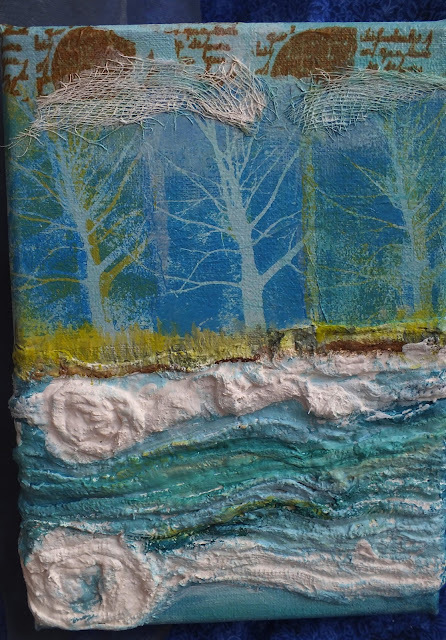 Tonight I'd like to share with you a 7" x 5" chunky canvas I created using strips of Plaster Wrap also known as Modroc. From the moment I learned about this material, on a workshop with Mary Jane Chadbourne last Summer, I was hooked! It's an inexpensive and magical way to bring dimension and texture to a canvas and it works brilliantly with Fresco Finish Paints and Treasure Gold, which highlights every peak and swirl. I love to create wild seas with foam and crashing waves and in my canvas I've included a tiny MDF house inspired by Mary Jane's Tinytopia class. Do you ever feel that your craft-room, studio or crafting space is a haven where you can take refuge from the busy, clamouring world around you? Well, this is the theme of my Modroc canvas with the Craft-room Fairy inviting you in! Step One: Plaster Wrap comes in a thick roll. You need to cut strips from this with good, sharp scissors. As you can see in the photo, I've put a towel over a plastic table-cloth, as this is a messy and wet process. I use an old ice-cream container for my supply of hand-hot water and I keep a supply of baby-wipes close by, as your hands become covered in the plaster. 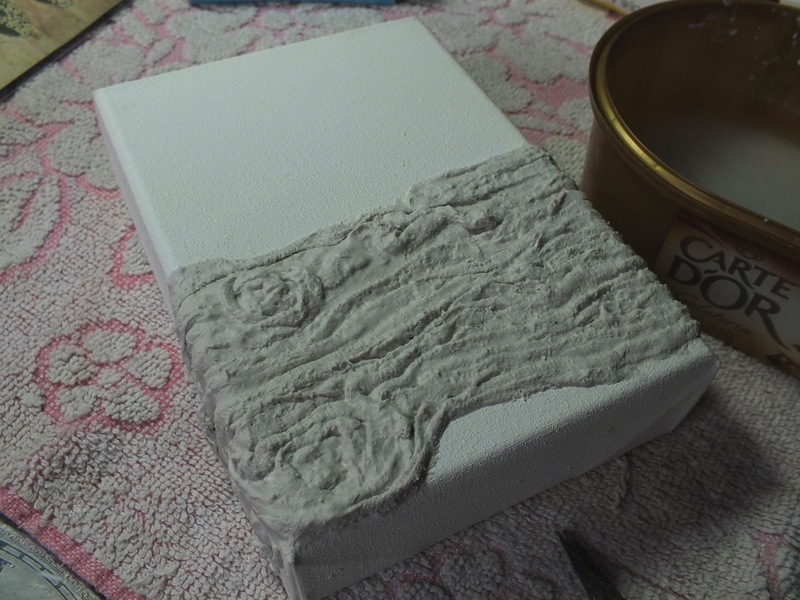 The first step is to soak the strips in the hot water and squeeze them a little, before attaching them to the canvas, moulding and building them into the effect you want to achieve. 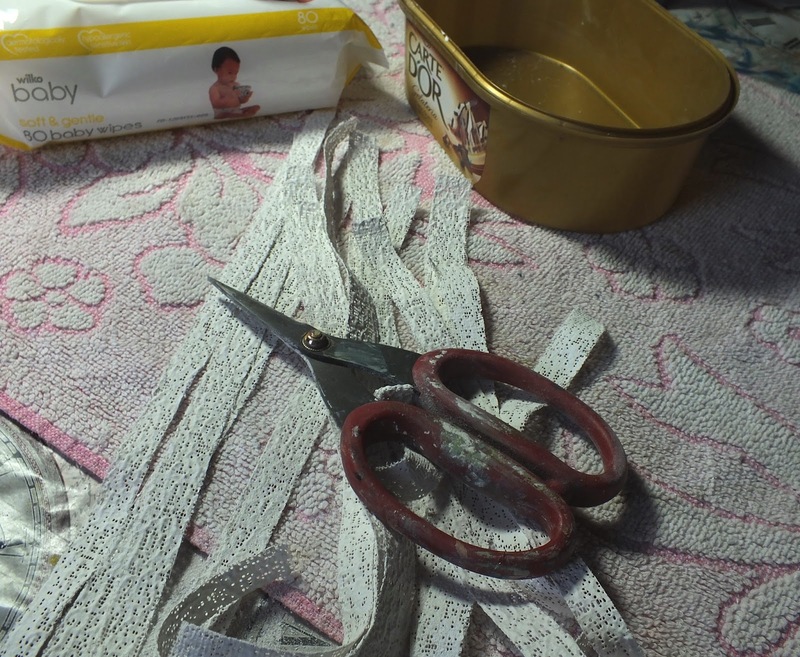 No glue is needed and there is time to sculpt the strips as you go before the plaster dries. Step Two: Below you can see how I created something resembling a choppy sea with only the Plaster Wrap and the hot water! I like to extend the plaster strips over the sides too. Now you have to be patient - something I find quite difficult when it comes to crafting - and leave the canvas to dry thoroughly. I usually leave it overnight. You can tell you're ready to go on to the next step when the plaster has morphed from a greyish white to dazzling, washing powder commercial white! Step Three: While you are waiting patiently for your Modroc to harden, it's time to think about a background. 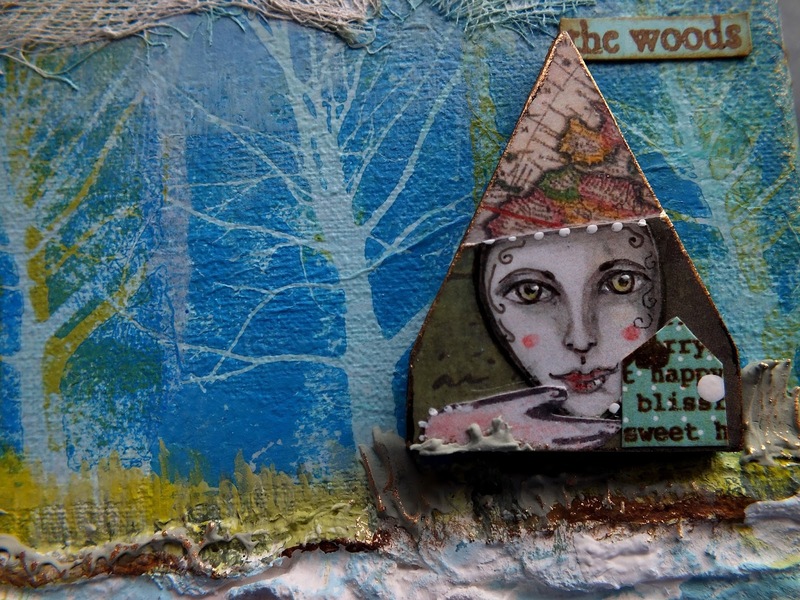 I wanted my little art studio to be nestling in enchanted woods. I like backgrounds to be whimsical, creating a suggestion of ethereal lands beyond the canvas and I think Urban Snapshot stamps are perfect for creating this effect. They are absolutely lovely for stamping with Fresco Paints. 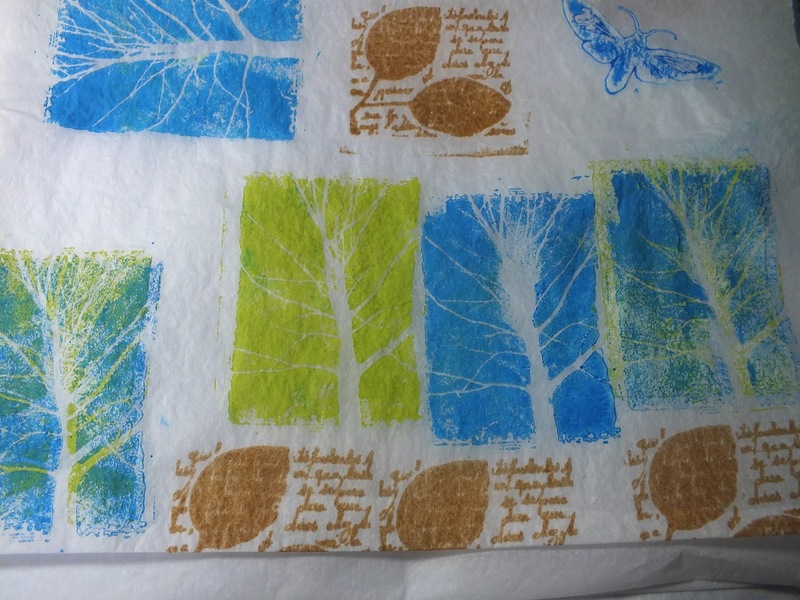 I used China, Granny Smith and Inky Pool on tissue paper with USNT3 on some white tissue wrap. I had fun over-stamping with three different paint colours. There's also some stamping in coffee Archival Ink too and a little moth that I decided to keep for another project. Step Four: Now, thanks to the magic of Blogland, we can fast forward twelve or so hours when we're ready to work on painting and sticking! I painted with a blend of Satin Glaze, Snowflake, Space Cadet, Smurf, Mermaid, Blue Oyster and Antarctic with a touch of Inky Pool on the edges to add depth. Similar colours are reflected in the waves, but there are touches of Winter Green and Turquoise in the depths. The grassy bank is a combination of Teresa Green, Granny Smith, Limelight and Winter Green. 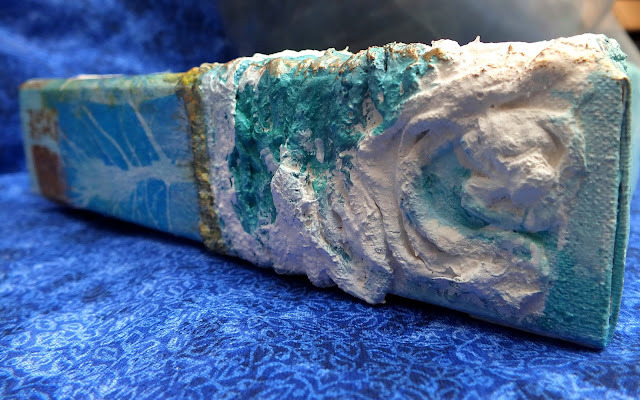 Step Five: I attached my torn tissue trees with PaperArtsy Satin Glaze with the tiniest drop of Smurf added. 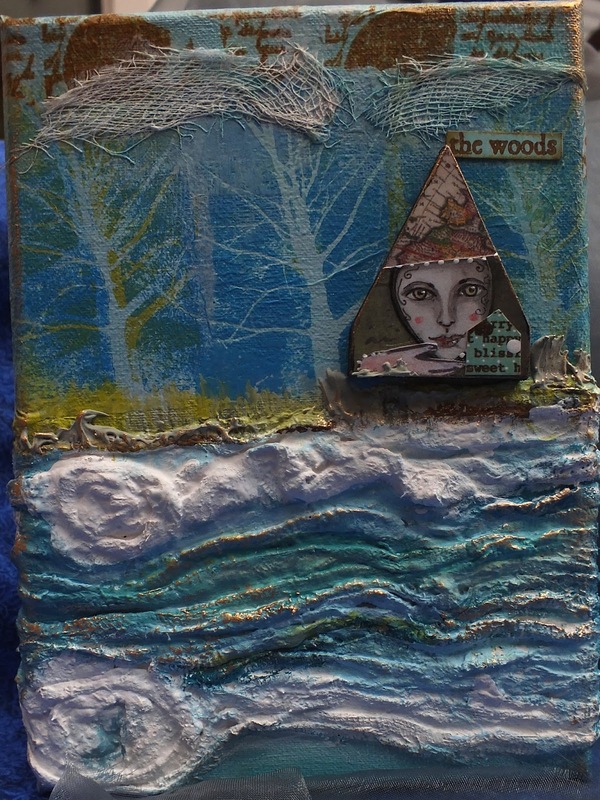 The trees and the script stamps were extended over the sides and top of the canvas. The fluffy clouds are cheesecloth - another of Mary Jane's great ideas! Once the basic painting is done, you can 'touch up' with some mark making with a brush for the grass. I've also added some touches of Chocolate Pudding for the earth. Step Six: All that was left to do was to add my welcoming little Craft-room fairy. I created her using my own artwork, collaged with a scrap of Chatsworth paper, a detail from an old map and can you spot a tiny section from ESN07 stamped onto a scrap of paper for a door? 'The Woods' is part of a quote from Robert Frost on USNT4, stamped onto card painted with Mermaid. I thought you might like to see a detail of how the design is continued over the sides of the canvas too. I hope you've been inspired to create your own little canvas world using Modroc. I love how sculptural this technique is - it's easy to create something that seems to invite the onlooker right in. I particularly like the potential for moulding waves, but this material is so versatile I've found it works for simulating everything from drapery to a rocky landscape. I'd love to see where your imagination leads you with this one! Combining Plaster Wrap with different PaperArtsy stamps and the wide array of Fresco Colours opens up so many possibilities. 'Bye for now from Julie Ann at Magpieheaven, Twitter, woletz1. We would love to see how you interpret this topic by linking what you make to our 2016 Challenge #6: Liquid Sculpting Medium, on this page HERE. All links go in the draw to win a £50 voucher to spend on products of your choice from the PaperArtsy online store. The Liquid Sculpting Medium link will close 17:00 (London Time) Sunday, April 3rd. The winner will be announced 2 hours later at 19:00.
this looks stunning, Julie Ann - Modroc is something else I've never used.. it looks great, if messy, fun. This is absolutely glorious, I just love those modroc waves! So inviting! Your tinytopia lady looks like she is sailing on a little boat. Perfick! So nice to see trees instead of a beach and I love the way you have done them with the urban snapshots. Love the cheesecloth clouds! Have just ordered some modroc and am now dying to add some fresco! Stunning project Julie - love it! Taking the time at last to hop over to the blog tonight, and seeing this I can tell you how gorgeous your whimsical project is Julie!!! I also love it! 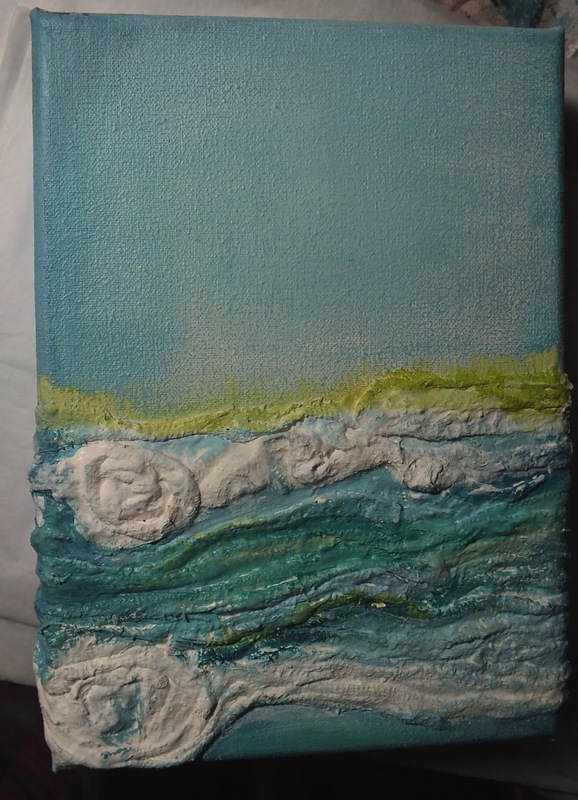 What a gorgeous little canvas Julie Ann and as with all your artwork there's definitely a story to be told there! I've never seen Modroc used or even heard of it till my Son mentioned he was going to get some of his art students using it recently. Your post is very informative and certainly inspiring and the Modroc texture is wonderful. I love it! And Mary Jane is amazing coming up with so many "tricks of the trade"
I missed MJ's class last Simmer and I always learn something new there. Thanks for sharing your process, I love the results! Maybe see you in class this Summer? Gorgeous canvas, Julie Ann! Thanks for the explanation of Modroc, interesting stuff. A wonderful textured make Julie and the Modeoc looks fabulous. This canvas has such a great combination of images and textures and images and as always I love the detail of your own art work too.